Jack in the Box will be the first fast food restaurant to offer 'contactless' payment at all their restaurant locations. 'Contactless' payment allows a customer to pay without having to swipe their credit card. These contactless readers are common at gas stations and 7-11 stores. 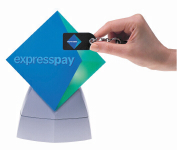 You'll have to have an American Express Expresspay, Discover Network, MasterCard PayPass™ or Visa Contactless card or device embedded with a chip that communicates with the reader via radio frequency. “Guests no longer need to fumble for cash and coins, swipe a card or sign a receipt. Since they activate the transaction themselves by holding their cards 1 to 2 inches from the contactless reader, they can keep control of their cards while our cashiers can focus on providing great guest service," said Michael Verdesca, director of point-of-sale systems for Jack in the Box Inc.
All of Jack's contactless readers should all be installed by the end of the year. more on contactless payments at wikipedia. These are systems already in full swing in Asia. I think that North American will move towards the ease of payment via the swipe. Makes you wonder, however, what all these radio waves and radiation readers are doing to our bodies as they bounce through the air doesn't it?